Send the kids back to school with something fun and healthy to eat! Boil ramen noodles until al dente, about 2 minutes. Drain immediately and run cold water over the noodles to stop the cooking. Place one bouillon cube quarter in the bottom of each Mason jar. Divide soy sauce, hot sauce and fresh ginger between the jars. Top with shredded chicken, pack the noodles down over the chicken. 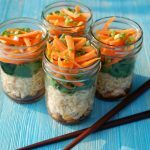 Layer the baby spinach, carrots and scallions on top. 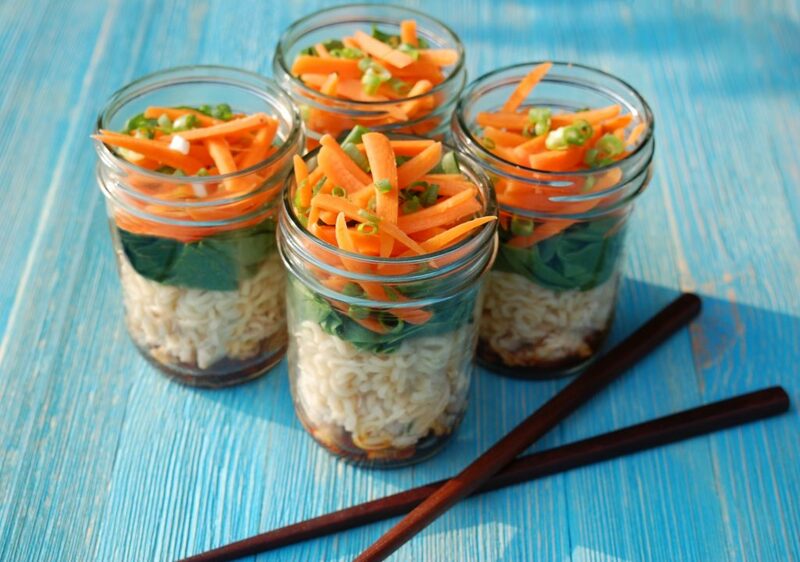 Seal and refrigerate the jars until ready to eat. When ready to serve, pour boiling water over the top of the noodles. Screw the lid back on and let steep for 2 to 3 minutes. Stir thoroughly and eat right away!